Fogo Azul NYC is New York City’s most powerful women and gender non-conforming community musical group. The Brazilian Samba Reggae drum line Fogo Azul (Blue Fire) was born at the intersection of founder and Buffalo, NY native, Stacy Kovacs’ passion for Samba Reggae, her deep respect for its cultural roots as a music of protest and resistance, her belief and activism in support of gender equality and her sense of civic duty in the current environment to publicly awaken and inspire women to resist oppression and exercise their power to uplift society —loudly. 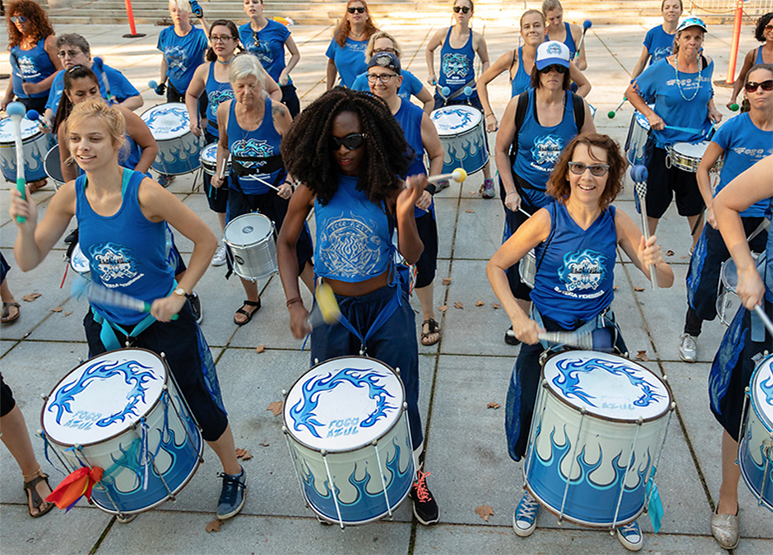 Launched in 2016 as an extension of Marcus Santos’s Samba Reggae-based Grooversity education project, Fogo Azul NYC is an age and ethnically diverse community who span the drummer spectrum from novice to professional.